Change can be intimidating. The uncertainty and risk inherent in its very nature can lead to a natural resistance from those involved. Yet change doesn’t have to be overwhelming. When implemented carefully and deliberately, it can be a powerful source of motivation and stimulation. Different types of change often result in different outcomes. Episodic and infrequent change may cause resistance and fear within an organization. Continuous and frequent change, however, has the potential to create an environment of innovation and learning. In effect, frequent change initiatives can form a stable foundation for success. That’s the story of FastCap, LLC, a manufacturing and product development company located in Ferndale, Wash.
FastCap is an exemplar of the continuous change model. Spurred by the leadership of Paul Akers, company founder and CEO, FastCap has become an innovative proponent of continuous change and improvement—not only in its own operations but in teaching others the benefits and methods of creating a culture of change. By following FastCap’s model, any organization can begin to create a safe environment for change and innovation. In 1997, Akers was building some cabinets when he had an idea for a self-adhesive screw cap cover. He turned that idea into the FastCap and began to market the creation at an international woodworking fair. Orders rolled in. Akers developed more products and established his company, running operations out of his home. As his business grew, Akers fought to manage his inventory and processes effectively. When it was suggested that he hire consultants to teach him about the Toyota Production System (TPS) and Lean, Akers jumped at the chance. 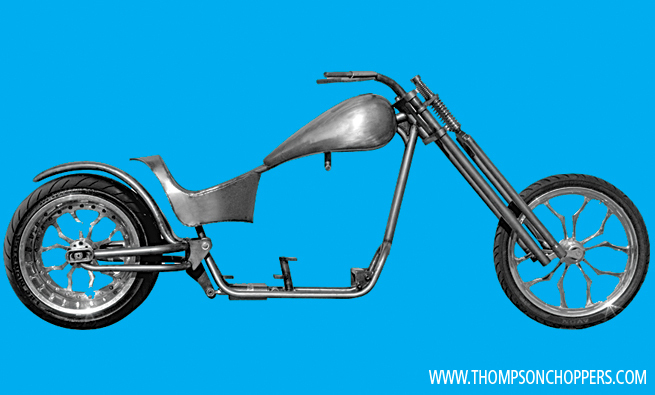 After taking the risk to implement these new processes and ideas, he made it his mission to manufacture products and run the company based on Lean concepts. Today, FastCap is a source of inspiration and information for many other organizations interested in Lean. Leaders from companies in industries such as healthcare, education, and manufacturing visit FastCap to learn the concepts of a Lean system. Akers offers consulting advice to others seeking to create environments of change. 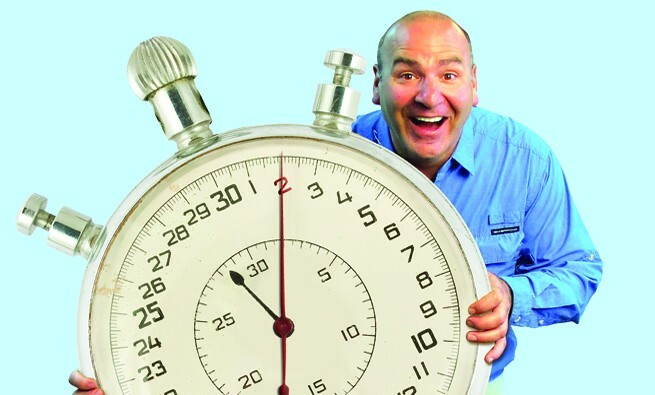 He produces hundreds of informative videos available to the public at Fastcap.com and has published a book titled 2-Second Lean: How to Grow People and Build a Lean Culture. The underlying theme of Akers’s model for change is simplicity. Successful implementation requires an organizational culture that nurtures and rewards constant innovation, and employees must feel safe and encouraged to enact change. Several key principles drive the change philosophy at FastCap to create that environment. Continuous improvement at FastCap is more a mind-set than a process. FastCap employees are taught to always be on the lookout for creating change through eliminating waste. By learning to identify waste, employees can then visualize how simply eliminating that waste leads to improvement. To reinforce the mind-set of continuous improvement, every employee at FastCap, including Akers, begins the day making what Akers calls a “2-second improvement.” Put simply, a 2-second improvement is any change in a process that makes the work safer, faster, and/or higher quality. The improvements reduce movement and frequently improve the clarity of communication. Focusing on small yet meaningful changes makes the idea of change less intimidating. Setting the standard at an easily attainable level enables employees to experience success and reduces resistance. Employees are empowered because the greatest ideas often come from those who know the processes best and will be most affected by the changes. And as the creators of the change, they are far more likely to embrace it. Standard work is a set of simple process steps that have been refined to eliminate or reduce nonvalue-added activities (waste) and that are employed by all within an organization. 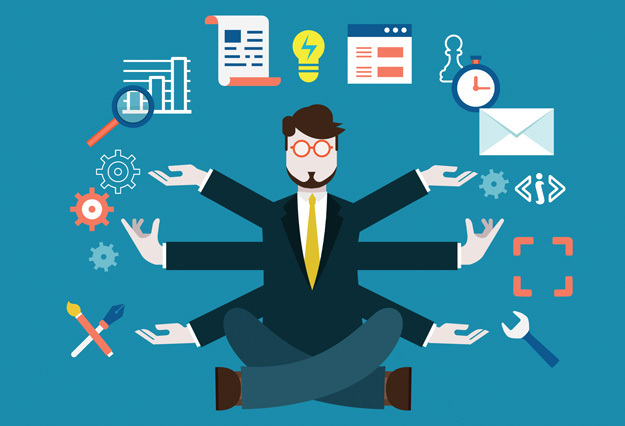 The concept of standard work could apply to processes as varied as how forms should be completed and processed, the format of an e-mail, or the assembly of a widget. At FastCap, there are simple eight-step instructions for standard processes with pictures and descriptions of all steps (see Figure 1 for an example). With consistent processes, it’s easy for a new employee to follow the documented steps, identify problems, and avoid mistakes. There’s little variation between the work outputs regardless of the individuals performing a particular task. This leads to increased quality and uniformity. Respect for the individual is at the core of all successful change. To maintain a culture of continuous improvement, everyone involved must be (and feel) respected. Employees must respect their managers and peers. Businesses must respect their customers and suppliers. Most important, managers must respect employees. Employee buy-in is essential. Those at the lowest levels of an organization are usually the ones being asked to carry out change on a daily basis. The employees who are asked to implement a particular change need to feel respected by those issuing the request or instructions. Otherwise, even if the employees agree with the need for it, the change won’t be sustainable. For change to happen continuously, those implementing it must feel passionate. Passion comes from feeling personally invested. People are personally invested when they feel respected and when their own ideas are the basis for change. 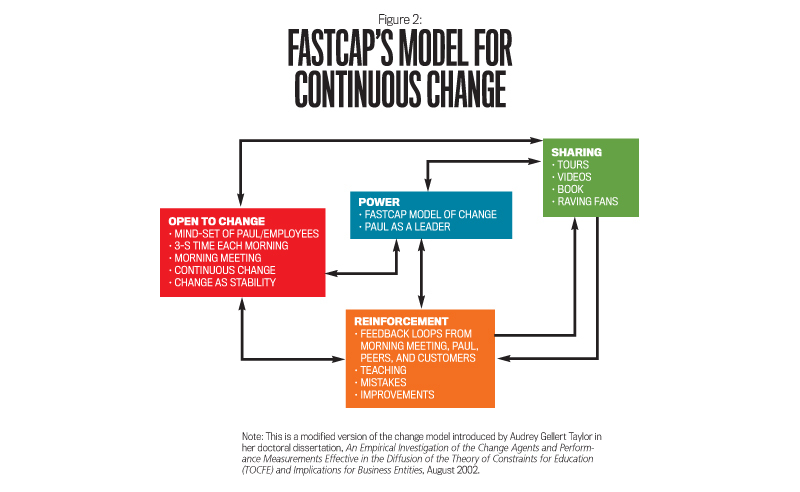 Akers has implemented a number of practices and feedback loops at FastCap to ensure that the business continues to run according to his model of change and improvement. The first two hours of every day are set aside for nonproduction activities. The first hour involves improving and cleaning the facility. During this time, all employees sweep, sort, and standardize (3-S) their work areas. Most 2-second improvements are made during the 3-S time. Sweeping, or cleaning, the facility is where employees learn to always leave an area better than they found it. Sorting allows employees to organize all value-adding tools and helps them understand that waste also can be organized. Sorting waste isn’t the goal. By exposing where waste exists, employees find it easier to reduce that waste. 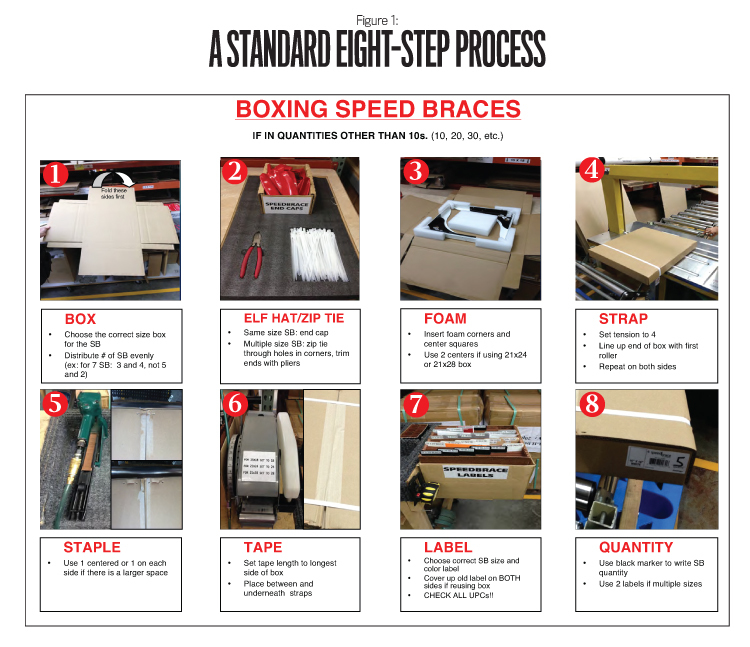 Standardizing gives employees time to create standard eight-step processes. The rationale behind taking this first hour of the day to 3-S is that it saves much more than an hour of time throughout the day because of the development of more efficient processes and cleaner work areas. The focus during production time can then remain solely on production. Akers states that the return for this time investment is worth the estimated opportunity cost of the time. FastCap’s order cycle time is an example of the kind of improvement brought about from more efficient work. The time it used to take between receiving an order via fax and having the completed order on the truck ready to be shipped was inconsistent and often days behind schedule. Since the implementation of Lean, the cycle time for the majority of orders has been cut to just two hours. If the answer is yes to any of these questions—and the improvement doesn’t negatively impact any of the others—then it’s worth pursuing. With these guidelines, employees have the autonomy to make changes to their workplace. This autonomy represents trust and respect between managers and employees. Allowing employees the independence to make decisions on how to change their workplace fosters a sense of positivity regarding change. Braced with the knowledge and training on how to handle and even implement change, FastCap employees become the backbone of the company as process modifications occur. Under this model, employees aren’t afraid to speak up about any resistance to organizational change because they feel respected and know that their opinions are valued. The second hour of each morning is the time everyone gathers for a company-wide meeting. This meeting is pivotal to the success of the company, its operations, employee morale, development of culture, and the management of change. Table 1 presents the general format of the meeting. While the format stays the same, a different employee leads the meeting each day. 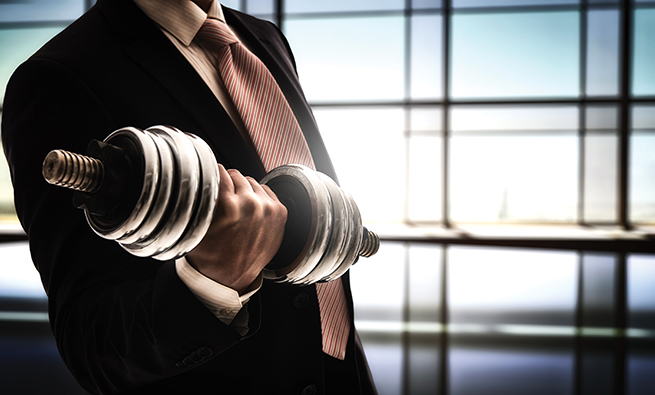 This gives all employees an opportunity to serve in a leadership position and gain confidence. 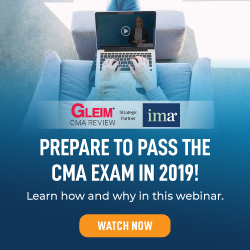 In addition, by “passing the leadership baton,” employees must internalize the concepts of managing FastCap successfully. Teaching is a reinforcing mechanism for the teacher. The morning meeting also breaks down the traditional wall between managers and employees, allowing for the free flow of information. The open communication feedback loops it creates, along with the general culture and attitude of improvement, demonstrate to employees that mistakes mean there’s room for improvement—and improvement is the goal. Using the feedback loop of the morning meeting where improvements are discussed, Akers has created a system where he can monitor progress and simultaneously give employees significant freedom. To help foster the ideas of equality and respect, there are no offices at FastCap. Even Akers doesn’t have an office of his own. All desks are standing desks built from materials at the warehouse. They all have wheels and, most important, are located on the factory floor. This setup also allows for transparency, accessibility, and increased communication. Daily interaction and easy accessibility to management means an open-door policy—or, since there aren’t any offices, a no-doors policy! Having the CEO of the company down on the floor where everyone else works comforts employees and shows Akers’s humility. Employees don’t feel as if they are less than those who have an office, and managers don’t lose sight of employee operations. This translates to increased levels of respect between each manager and employee. To maintain the culture at FastCap, Akers is selective about the people he brings into the company. When hiring new employees, he looks for people with a mix of gratitude, humility, and a positive attitude. Measuring progress and evaluating efforts of innovation and change is difficult. The goal of implementing any improvement is to create financial benefit, but the initial measures may not immediately reflect the desired positive financial results. So how do you measure and reward a mind-set when quantifiable evidence that defines an improvement may not exist? 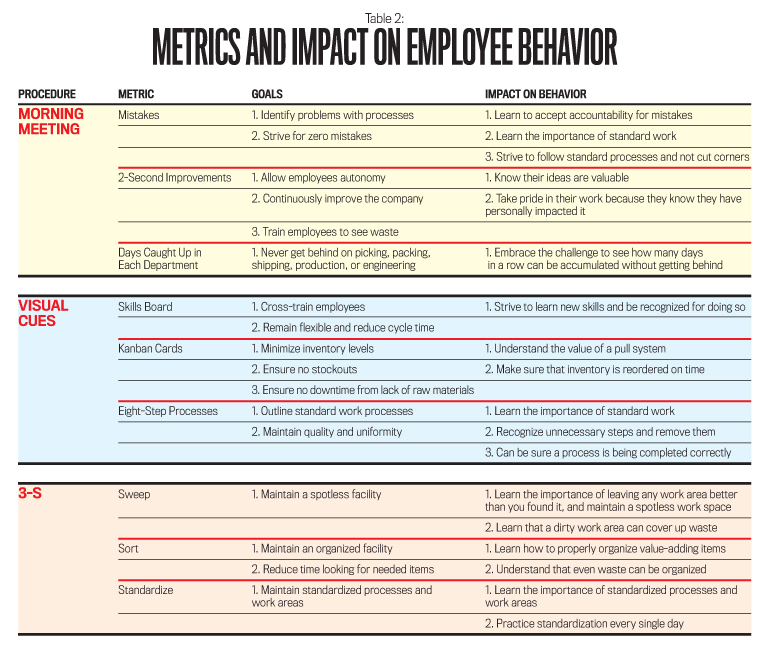 Metrics must be used to monitor movement toward the established goal. Frequently, these are subjective in nature. In Levers of Control, Robert Simons says, “Rewards are subjective when superiors make personal judgments based on both fact and intuition as to the appropriate level of reward for participants. 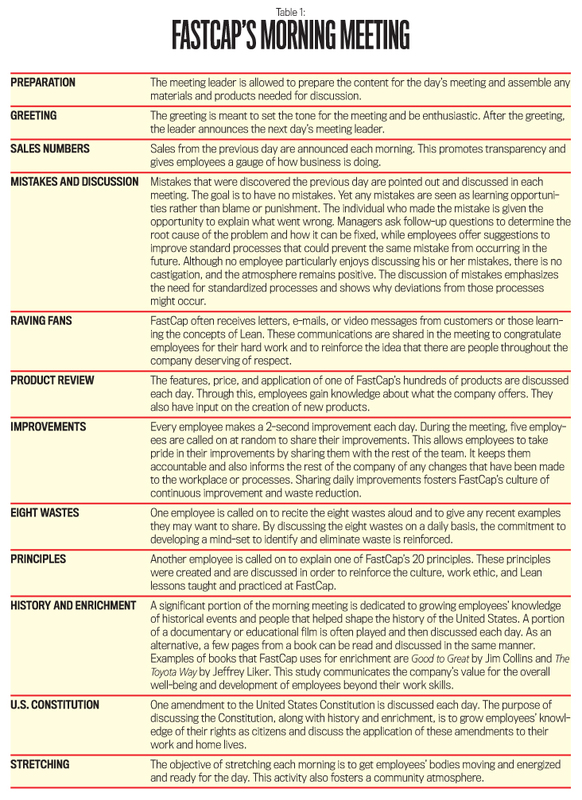 Subjective rewards allow managers to recognize innovative behavior that is difficult, if not impossible to measure.” When innovative behavior and creative thinking are the goals, such as at FastCap, rewarding contribution rather than results stimulates organizational learning (see Table 2). When employees understand that their efforts—and not just outcomes—are valued, it reduces the fear of failure that is inherent in implementing new ideas. Akers is constantly complimenting employees on their innovations and improvements, even when those efforts aren’t successful right away. Over time, employees who are given this freedom to fail on the route to improvement become more successful. Shortly after implementing Lean at FastCap, Akers began to distribute resources for others interested in Lean. He also opened up the FastCap facility for tours. In addition to helping others by sharing the lessons learned at the company, the openness and accessibility help the employees as well. A tour of FastCap begins with visitors helping Akers clean the factory bathrooms. They literally see Akers on his knees, scrubbing toilets and mopping floors, and must do the same themselves. This simple act shows with little fanfare how work is respected and titles aren’t important. The tour then continues with a walk around the plant, where visitors can view the current visual cues and process changes made by employees. The tour also includes attending the morning meeting, where visitors get to see and hear the discussions of yesterday’s mistakes and improvements. For employees, having guests in attendance at the meetings emphasizes the importance of transparency. 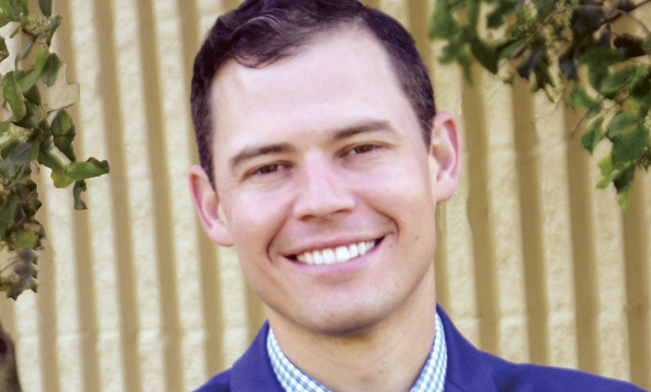 We have gone on the tour several times ourselves and have witnessed Akers and/or Jon Lussier, FastCap’s general manager, share mistakes they made and describe the processes they are implementing to ensure the mistakes don’t reoccur. Through the tours and the website of Lean resources, Akers has helped many companies transform their practices to be simpler and more successful. Many managers searching for help with their Lean implementation have found the FastCap website, viewed the online videos, read 2-Second Lean, and then contacted Akers. Several have flown to Ferndale, toured the plant, and even stayed in Akers’s home while learning more about Lean. Several managers are in daily contact with Akers by phone or Skype. Organizations pursue change to enhance their competitive positions and adaptability in volatile markets. Simultaneously, they seek to reduce uncertainty and, therefore, strive for stability. Stability also increases both confidence and competence. As described by Patricia Klarner and Sebastian Raisch, this need for simultaneous change and stability creates an organizational paradox (“Move to the Beat Rhythms of Change and Firm Performance,” Academy of Management Journal, February 2013). Through the implementation of its continuous change model (see Figure 2), FastCap has been able to overcome this paradox to build a sustainable enterprise that incorporates change and stability simultaneously. By encouraging continuous change, it has become the norm. In effect, change is the stable state. It’s practiced every day by everyone in the company. Change is no longer the enemy of stability—it’s the catalyst. Paul Akers and FastCap have demonstrated the possibilities for any organization with the right leadership and mind-set. With strong leadership and support from top management, Lean practices can open employees’ minds, freeing them from the fear of change. Setting aside time each day to standardize processes and make small improvements, establishing a culture of open communication, and lowering the barriers between employees at all levels of the organization can lead to great returns. Audrey Taylor, Ph.D., is a professor at Western Washington University in Bellingham, Wash. She is also an IMA® Member-at-Large. You can contact her at audrey.taylor@wwu.edu. Amy Puckett is a staff accountant at Soukup, Bush & Associates, CPAs, P.C., in Fort Collins, Colo. You can contact her at amy.j.puckett@gmail.com.